Tim Visser is typically Dutch, not shy of saying what he thinks and not short on confidence, and may be just the tonic that Scotland need right now. He has replaced the injured Sean Maitland – with Sean Lamont, who was a late replacement for Maitland in Cardiff, dropping to the bench. The selectors may have picked Visser even if the Kiwi had been fully fit because Maitland is a long way from his best form. In contrast Visser is just two months shy of his. At the tail end of 2015 the big Dutchman scored five tries in the space of three matches for his club Harlequins, including a hat-trick against the hapless London Irish where his rival Maitland started on the bench. Try scoring is, as Visser explains, his best asset if only because it is his one trick. “It’s just what I do as a player,” replies the Dutchman when asked about his finishing prowess. “That’s the only thing in rugby that I am genuinely good at. If you look at what I do over the last six to eight years, it is the only thing consistently that I can actually do. “You have to trust in yourself as a player to be able to deliver on that. I am obviously heavily dependent on how the games go and on the players inside me but I trust myself to be in the right place at the right time because I tend to be good at that. “I think there is only so much pressure you can put on yourself and you can bring me in to be a finisher but I can only finish if there is something to finish. At least Visser, unsullied by the previous two losses, brings the optimism of the untried, having missed the opening rounds thanks to a hamstring injury. A naturally upbeat character, the big winger is a world-class finisher even if several of his shaky defensive duties are sure to be tested by Italy come Saturday. He moved to Harlequins last summer was at least in part because the Londoners’ expansive rugby meant that he had something to do other than twiddle his thumbs on the wing which was his main occupation at Edinburgh. 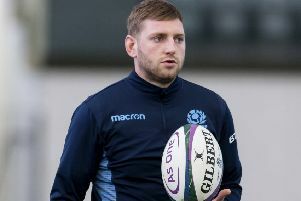 Scotland too are set up to play 15-man rugby, with two openside flankers in the forward pack, while midfielders Finn Russell and Mark Bennett are both due a good match inside him. Visser should see enough of the ball to make a difference, especially if he is encouraged to go and look for it rather than stand like a guardsman at Buckingham Palace waiting for the action to find him. While others have been perplexed at the change that has overcome Scotland, from World Cup success to Six Nations struggle, the winger insists that everything looks the same to him and that one win would open the floodgates. “From where I left it off in the World Cup it’s still the same old group and playing the same rugby that was successful for us in the World Cup,” he says. “It’s tight margins, as usual, the same old story. But it really is. A couple of years ago, when I played in the Six Nations we finished third. That year we won narrowly against Ireland at home and we beat Italy and suddenly you are third in the Six Nations. “It’s easy to say, ‘Oh, Scotland have lost two games …’. But even last year we lost by three points at the Stade de France (it was six), lost by three points to Wales (it was three) and end up last in the Six Nations! If you win one or both of those games, and it literally is down to one kick (or two), then suddenly you are in the top three. It reflects on the quality of the tournament, I guess. Easier said than done against an Italian team that always believes it can beat Scotland. It won’t be easy and the Scots have a nasty habit of retreating into their shells in Rome, as happened four years ago when Andy Robinson’s team barely exited their own 22 throughout a miserable second half. Vern Cotter’s side could be forgiven for doing the same if they read all the criticism in the press but that isn’t an issue for the Dutch winger. “I just don’t read the media any more...so that helps,” says Visser. “We are not massively in contact with the public...so that helps. I guess if you were into all that then it’s hard to ignore it because we are a results-based team and we have lost two games in the Six Nations so they will be out for you, that’s the way it works.